Fettuccini is tossed with a fresh white clam sauce for an elegant spread for any occasion. 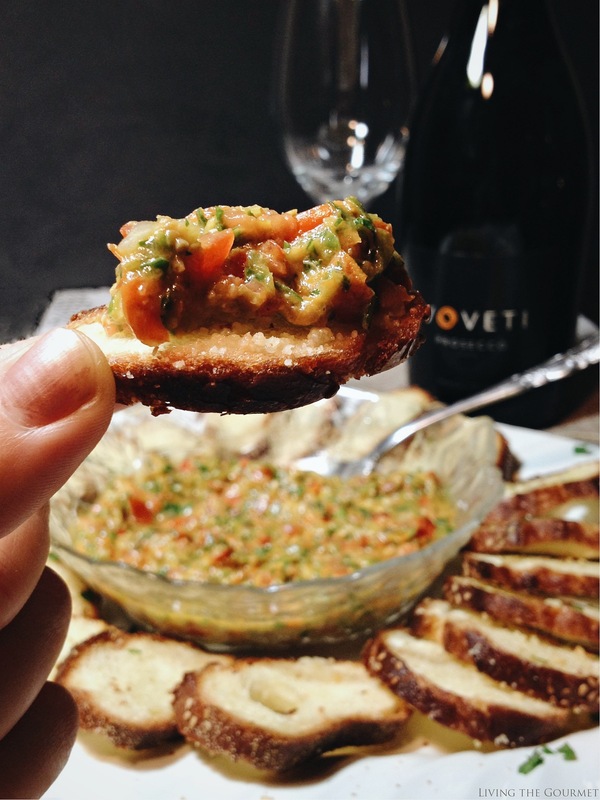 The meal is complimented with unique crostini, a capri-style appetizer and VOVETI Prosecco. To put it bluntly, I’ve felt like its winter since before the winter even started. Between endless lines of seasonal content, and late nights hunched over a keyboard, suffice it say it’s been something more than easy to feel like the overworked protagonist of your favorite low-budget comedy-drama who stands jadedly between learning how to live life, and just barely going through the motions. Yet, I was determined not to let myself slip. Like Dorian Gray realizing he was own demon, or like Faust, whose troubles were of his own making, I decided to shake a proverbial fist at my seasonal gloom, and enjoy myself. To help lift my spirits, I invited a few close friends over for an impromptu dinner party. To prepare, I had my son finish up his assignments early, a seemingly never-ending project, while my daughter finished the rest of decorating and assembled the night’s playlist. While they did that, I ran to the store for a few last minute supplies, in particular the clams for the sauce I was planning, along with a few fresh loaves of Italian bread, since I prefer to buy both of those no more than a day ahead of time. After I got back home, I put together an antipasto with fresh mozzarella over sliced tomatoes with herbs and olive oil, and assembled the rest of the platter with olives, pepperoni, sliced parmesan cheese, and infused olive oil for dipping. The antipasto led into a clam sauce over fettuccini, served with homemade crostini and a fresh tomato salsa. The menu was meant to emphasize and encourage the festive nature of the night, as well as the company. 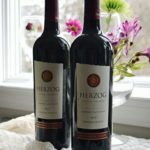 To change things up a little, however, I began the evening by serving a hearty Cabernet Sauvignon with the first round of appetizers instead of the dinner – heresy I know, but I felt the solid red complimented the perhaps somewhat heavier tone of what was on offer as appetizers. 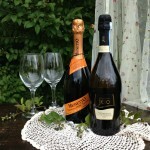 With the dinner itself, I instead served a VOVETI Prosecco, and I did this for a few reasons. 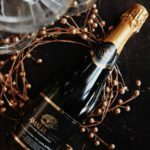 First and foremost was the mood I was going for, and so I felt that this chic, modern Italian prosecco would help accentuate the classic style I was going for, while still being accessible for everyday gatherings. Combine all of the ingredients for the salsa in a food processor and process to a desired consistency. If there is too much liquid in the salsa, place the mixture in a colander and drain the extra liquid. Place in a serving bowl and refrigerate until ready to serve. Place bread slices on a baking sheet and brush with olive oil on each side and sprinkle grated cheese on each slice. Serve the crostini with the salsa. Heat a large frying pan with the butter and olive oil. Add the garlic, red pepper flakes, salt and black pepper and sauté until fragrant. Add the clams with their juice and heat to gentle boil; reduce to a simmer and cook three to five minutes. Add the pasta to the pan along with a drizzle of olive oil and more red pepper flakes, black pepper, fresh parsley sprigs, grate cheese, lemon juice and toss. The prosecco paired excellently with the clam sauce, just as I had expected, since, as with most prosecco, this VOVETI Prosecco is an excellent pairing either with light seafood, spicy dishes, or as the perfect end to a pleasant evening. 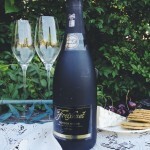 What are some of your favorite prosecco pairings? 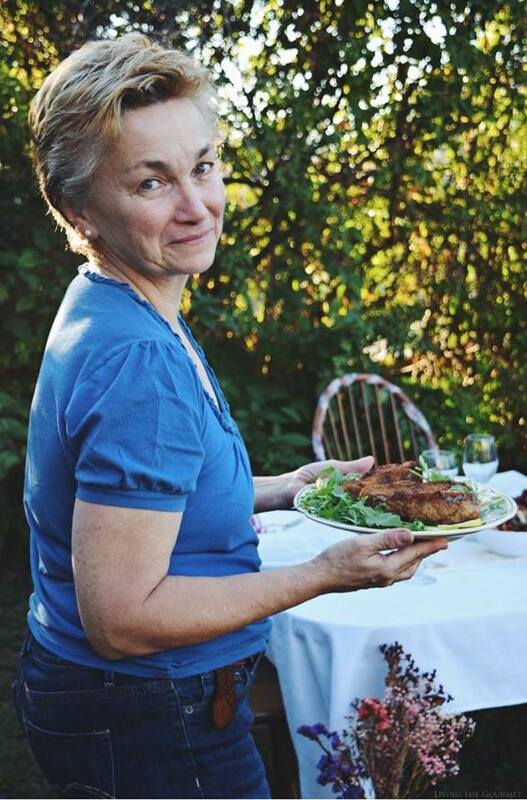 Or what are some of your favorite dinner party recipes? We would love to hear from you. I haven't had pasta with clam sauce in forever - this looks delicious! Gorgeous meal! I had to click on this when I saw "clam sauce". That was my dad's favorite meals! Gave me a wave of nostalgia! This meal looks wonderful from the crostini down to the fettuccini, Catherine! Perfect for holiday entertaining! 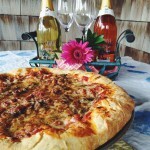 This is an amazing idea for a dinner party! Love that you threw a spontaneous get-together like that. I have had some trouble lately too with the short days and cold weather - it always takes some getting used to.